Lex is the best totally blind long and triple jumper in the history of the U.S. Paralympic movement. He is the current world record holder in the long jump, a four-time Paralympic medalist, a three-time long jump world champion, and an 18-time national champion. 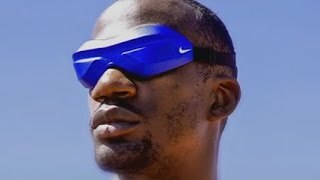 He is the only totally blind athlete to ever eclipse the 22-foot barrier in the long jump. If you think that any of this came easy, you should think again. Many of his fellow eight-year-olds could be seen riding bicycles, shooting baskets, or frolicking on nearby playgrounds, but Lex was dealing with a far more challenging opponent. His sight began to slowly fade entirely due to recurrent retina detachments. Ten operations failed to stabilize what little sight he had left. After the final surgery, Lex's mother Verdina Gillette-Simms, had the difficult task of telling her son he would likely never see again. As painful as this was, she vowed to teach Lex everything he would need to know to be successful in life. Her hard work and love were the foundation for Lex's accomplishments. At the age of 19, Lex won his first Paralympic silver medal in the long jump. His achievements at the 2004 Paralympics in Athens, Greece were the culmination of years of hard work and training. Since that time, Lex has solidified himself as a tenacious competitor for Team USA. Each of his athletic performances since that time have resulted in medals with the most recent being gold in the long jump at the 2017 Para Athletics World Championships. Lex now has his sights set on the 2020 Paralympic Games, and he is currently training and competing to make his fifth consecutive U.S. Paralympic team. There is one goal, and that is to win gold for the United States of America. As an athlete, motivational speaker, and singer song writer, Lex epitomizes the phrase "No Need for Sight When You Have a Vision®".